The fireworks business seems to be flourishing in the southern parts of the United States. Driving through the south you see a lot of advertisements for fireworks to suit your every need. From sparkers to the big boomers, you can get whatever you need to celebrate the next holiday or birthday. On a recent trip to South Carolina, we even saw a sign that said we could purchase fireworks on DVD! Really!? Do people actually spend money to watch fireworks on television? That seems to fall terribly short of the real thing. Sort of like staying home from church to watch religious programming. “Let us not give up meeting together, as some are in the habit of doing, but let us encourage one another—and all the more as you see the Day approaching.”—Hebrews 10:25. 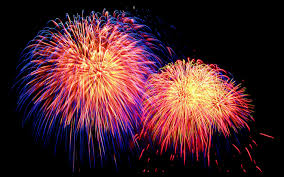 This entry was posted in Christian Living, Church, Communion Meditations and tagged church attendance, fireworks, fireworks on television, Hebrews 10:25, illustration, worship. Bookmark the permalink.